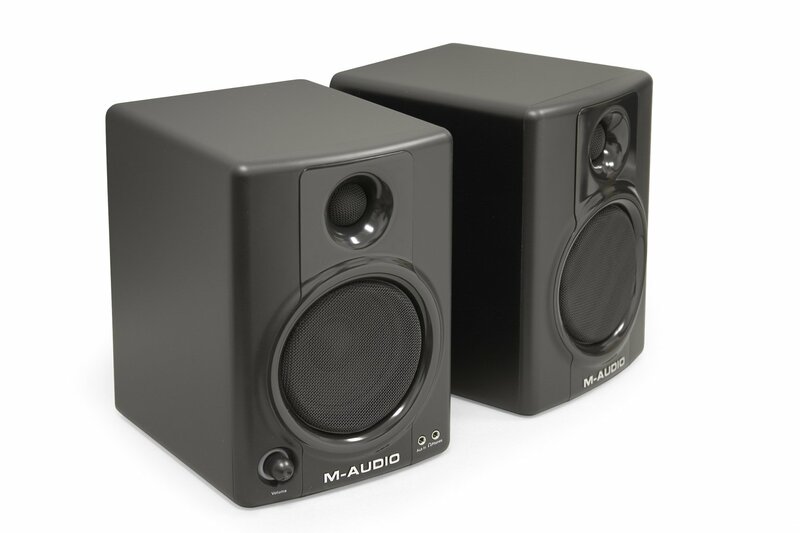 M-Audio presented the Studiophile AV40 and AV20 active speakers at Winter NAMM. They are positioned as a compact solution for limited space or travelling musicians. Digits in the model name denote the amp power. The Studiophile AV40 speakers have MDF cabinets, 4" LF polypropylene-coated woofers, 3/4" ferrofluid-cooled silk dome tweeters. 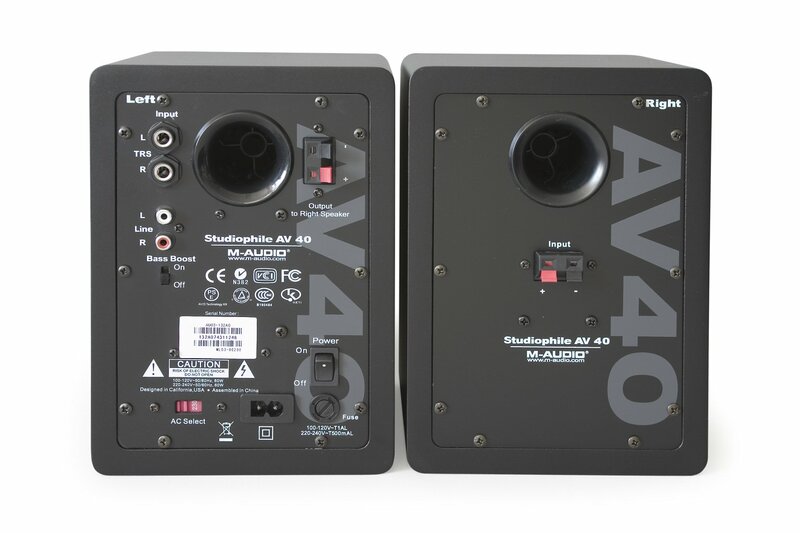 The AV20 has a 2" woofer and a Mylar tweeter. Today we shall examine the AV40 model. 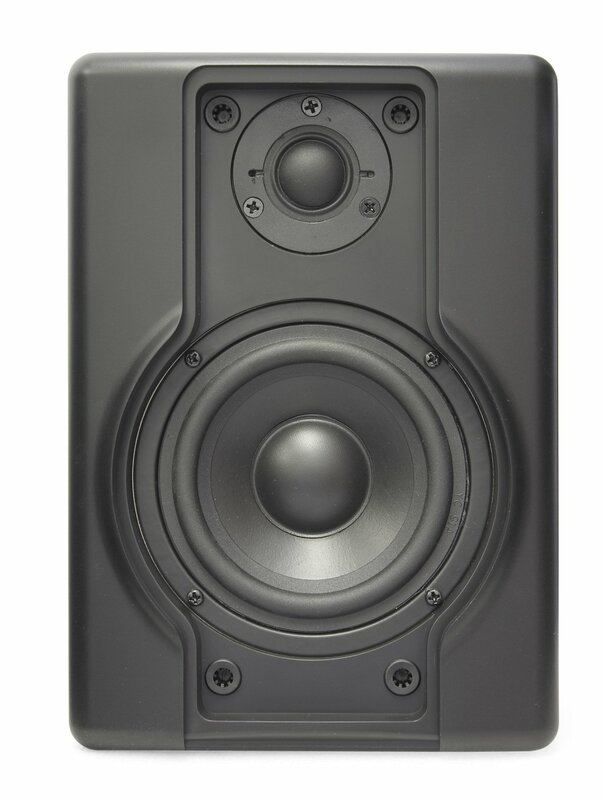 The MDF speakers have bass reflex port design and dimensions of 15.2 x 22 x 18.4 cm. There are no feet, but the bundle includes a self-adhesive rubber gasket the size of the enclosure base. Thorough examination of the enclosure reveals that the plastic front panel protecting speakers from mechanical damage can be removed, so we can examine the speakers in more detail. The manufacturer uses silk dome tweeters for HF speakers. Dome diameter is 22 mm. The woofer diaphragm is 9 cm in diameter. Damped rubber surround is quite soft to the touch. Both speakers are magnetically shielded. General volume is controlled with a knob on the front panel of the left speaker. There is also a headphones-out and an additional mini-jack. We should mention that the volume control and headphones-out are installed in a convenient place. The amplifier is in the left speaker. Passive speakers are connected to spring clips for bared wires. The rear panel also houses the Bass Boost switch, a power switch, and two line-ins with RCA and TRS 1/4" (6.3 mm) connectors. Let's proceed to frequency response measurements for which we use RightMark Audio Analyzer PRO. All readings were taken in identical conditions. An anechoic chamber (walls, ceiling: 15 mm mineral tiles + 50 mm Izover KT 40-50 acoustic insulation, wooden frame with rubber vibroisolation from the walls). No standing waves in test signals, with minimal uniform reverberation field. Judging by our readings, the frequency range of the speaker is 85 Hz - 30 kHz with ±4 dB bandpass flatness. The Studiophile AV40 specs mention the 85 Hz - 20 kHz range. As we can see, the bottom limit agrees with the specifications. Unfortunately, the specs do not include irregularity of the frequency response. However, our readings demonstrate good results, even though these are budget speakers. We should also mention that the LF range can be expanded with the Bass Boost mode. 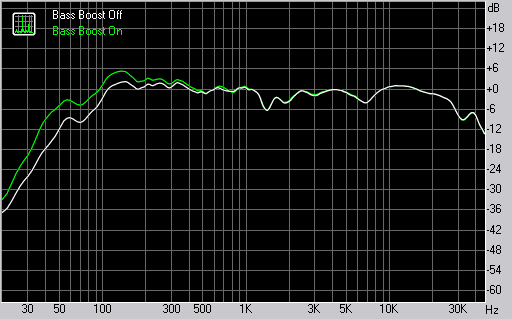 Judging by our readings, Bass Boost mode raises LF frequencies, which reach 6 dB at 60 Hz. In our opinion, the Studiophile AV40 speakers accentuate the LF range. It often happens in small speakers. To all appearances, expanding the LF range was the first priority task for the manufacturer. Bass Boost speaks in favor of this assumption. There is no acute need in this mode, because the sound is oversaturated with low frequencies even without it. Bass Boost significantly amplifies booming. Anyway, you may use an equalizer and reduce LF a little. 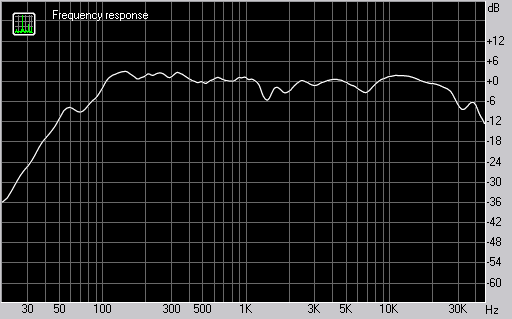 Medium and high frequencies in the Studiophile AV40 are not bad. There are no evident problems with these frequencies, but we cannot praise them either. We should also note that the Studiophile AV40 is a budget solution, and you shouldn't expect much from these speakers. Many readers are interested in a comparison with other active speakers. We should take into account market peculiarities. Besides, M-Audio belongs to professional audio manufacturers. Thus, we shall refrain from such comparison. 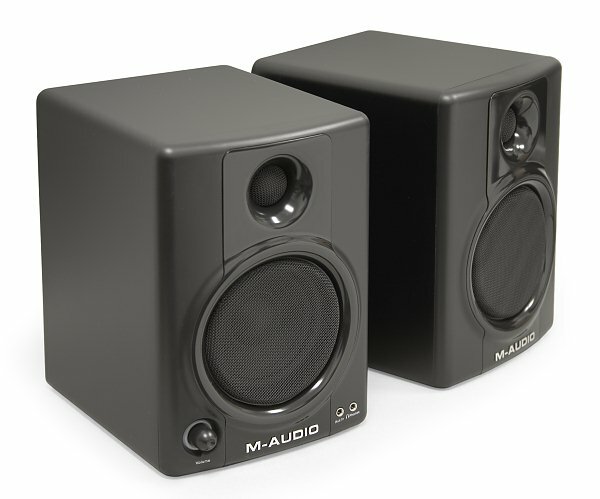 M-Audio expands its product line to fill the budget market. 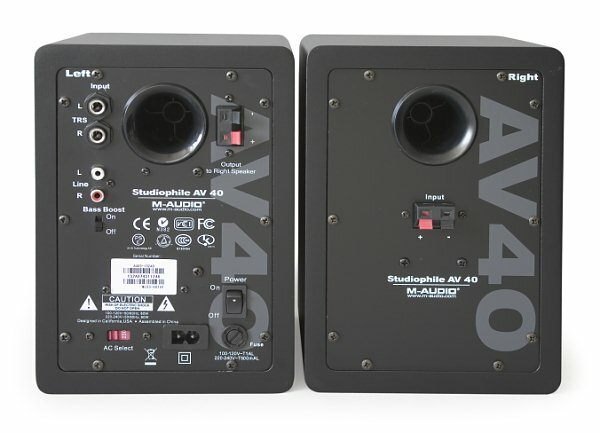 The Studiophile AV40 resembles the previous model StudioPro 3. It's an advanced modification with balanced inputs and expanded LF frequency. In our opinion, the Studiophile AV40 is positioned correctly. The speakers have compact dimensions, so they are indeed convenient to transport. Besides, an additional input, headphones-out, and a volume control on the front panel raise usability of these speakers. What concerns professional usage, these speakers are a compromise, of course.